In today's world of fast paced action adventure and FPS games strategy, RPGs are often overlooked, or sometimes completely disregarded as a whole. While most games offer a feeling of instant gratification there are those that make you work for it. 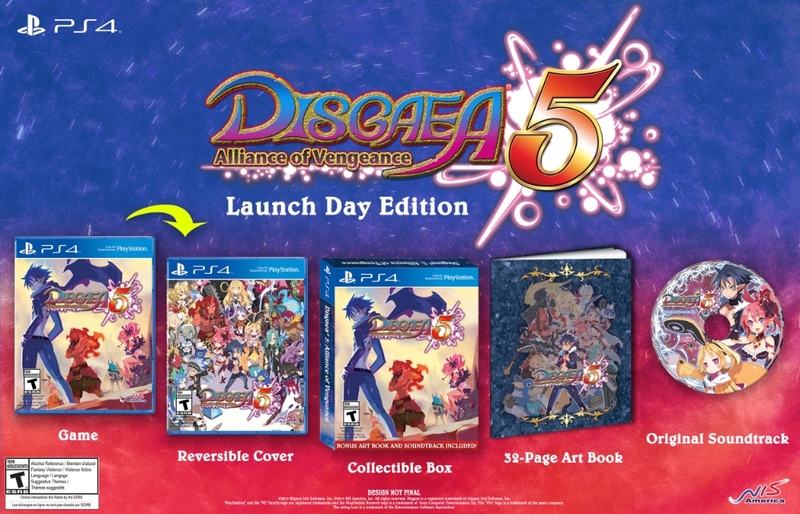 Enter Disgaea 5: Alliance of Vengeance. This newest entry in NIS America’s flagship series offers more than any of it's predecessors and, much like the title might suggest, makes it's fashionably late arrival to the Playstation 4 with a vengeance. Where to begin d00d?! Following the the footsteps of its older siblings Disgaea 5 is massive. So massive in fact that I have spent the last few weeks with the game and still discover a new feature practically every time I play. All of the favorites are here; Item World, Assembly room, Reincarnation, Magichange, and of course prinnies. Incorporating a few new features like being able to equip two weapons, and “Revenge Mode” Disgaea 5 is one titan of a game. Let's talk about the cast of this adventure through the good ol’ Netherworld. Your main character this time around is a demon named Killia. While not an overlord, Killia is an extremely powerful demon seeking revenge against the game's main antagonist Lord Void Dark. There is also the female counterpart, the Etna of the game if you will, named Seraphina. She is the overlord of Gorgeous, and plotting to destroy Lord Void Dark to get out of an arranged marriage. The rest of the cast consists of Red Magnus, Christo, Usalia, and Zeroken, a mix matched group of overlords and royalty all attempting to take down Lord Void Dark for their own reasons. While incredibly unique in their own right, each character almost seems to take influence of previous heroes. Unlike previous entries in the franchise I have yet to find a character that I find grating, or annoying. All of the characters add their own element in developing the story and as such, make the player more attached to the team as a whole. The dialogue and story development is by far the most in depth to date and provokes the feeling of watching an animated movie. This game is just gorgeous. From the character sprites, the environment, heck even down to the menus, everything about this game practically jumps out of the screen. I’ve never seen prinnies this gorgeous. There are a ton of new skills and combos as well as many classics. Following in the footsteps of Disgaea D2, and Disgaea 4, the characters are all in HD and all look as if they were hand drawn on demand. On to the core of every good strategy RPG; Disgaea 5 offers what is practically endless game play. With the majority of today's games consisting of either a six hour campaign and pvp, or a monolith of content, this game definitely takes the latter. This entry in NIS America’s cult favorite is outstandingly large. From the infinite abyss of the Item World, to finishing newly incorporated “Quests” there is absolutely no shortage of content to be found. To think, they are planning on DLC for this thing?! The battle system holds true to the standard Disgaea formula; grid based tactical strategy RPG. Newly implemented in this title is the Revenge meter. Upon taking damage, allies being bested, and enemies powering up you receive a boost to your revenge meter. Once the revenge meter is full you have the opportunity to use an Overload ability, think of limit breaks from FFVII. The Revenge feature offers a new and immersive element to the standard formula by adding a small feature. That's not all either! 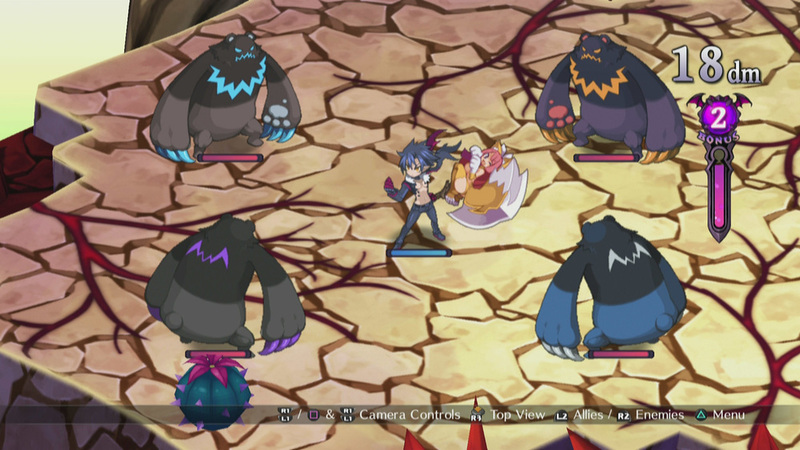 Disgaea 5 boasts all out warfare with the ability to have 100 unique character sprites on the battlefield at once. Refer to the previous paragraph for rants about how big and beautiful this game is. If I am being completely honest, I am having a hard time finding flaws in this game. I have enjoyed just about every second I have spent playing Disgaea 5 but I will say there are a few things that take some getting used to. You no longer unlock classes via reincarnation or leveling up, instead it is all quest based. I have also found that there is so much content that they sometimes overlook explaining how to work the mechanic. While it doesn't take long to figure out most of the time, it can be frustrating wasting EXP or HL on the wrong thing because you didn't understand what was going on. Not like that happened to me or anything. Overall this game is incredible. NIS America has successfully held true to what separated the Disgaea franchise from the sea of SRPGs and implemented just enough flair to make it feel brand new all over again. Although some of the new mechanics and changes may scare or confuse veteran players it isn’t nearly enough to take away from the experience. Disgaea 5 offers an insanely large amount of content, a vibrant cast, and a fulfilling story that is never compromised by gameplay to provide a beautiful addition to this already amazing franchise. This prinny gives it a 5/5 d00d! Be sure to grab your copy when it is released stateside on October 6th at retailers and online! As always thank you to NIS America for the review copy, and for making such an incredible entry to a series I already hold very dear.